A recent Department of Defense report to Congress as well as a number of media investigations have exposed government plans to deploy tens of thousands of drones over the US mainland in the coming years. Unmanned aerial systems (UAS) and unmanned aerial vehicles (UAVs), commonly known as “drones,” are extremely sophisticated remotely-operated aircraft, developed and manufactured by the military-industrial complex in recent years at a cost of billions of dollars. Drones vary in size from the four-pound RQ-11B Raven surveillance drone, which can be launched by hand, to the giant MQ-9 Reaper combat drone, manufactured by Northrup Grumman. The Reaper has a maximum take-off weight of 7,000 pounds, including up to 3,000 pounds of bombs, missiles and other armaments. The infamous MQ-1 Predator drone, armed with 100-pound Hellfire missiles, is the Obama administration’s favored weapon in its illegal assassination program. 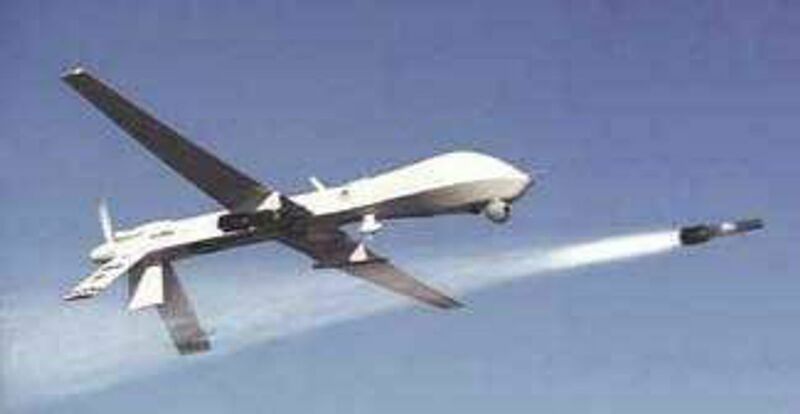 A Predator drone was used in the unprecedented assassination of a US citizen, Anwar al-Awlaki, in Yemen last September. With a push of a button, thousands of pounds of high explosives can be dropped on anyone, anywhere in the world, with startling precision. Safe behind video screens at military bases within the US, military drone operators refer to their victims as “bug splats.” Thousands of innocent civilians have already been murdered in this way in Iraq, Pakistan, Yemen, Somalia, Afghanistan and elsewhere. An April Department of Defense report, titled “Future Unmanned Aircraft Systems Training, Operations, and Sustainability,” reveals that a massive drone infrastructure is already being erected within the US, with billions of dollars being allocated, bases being erected, thousands of pilots and crews being trained, and inventories being stockpiled. 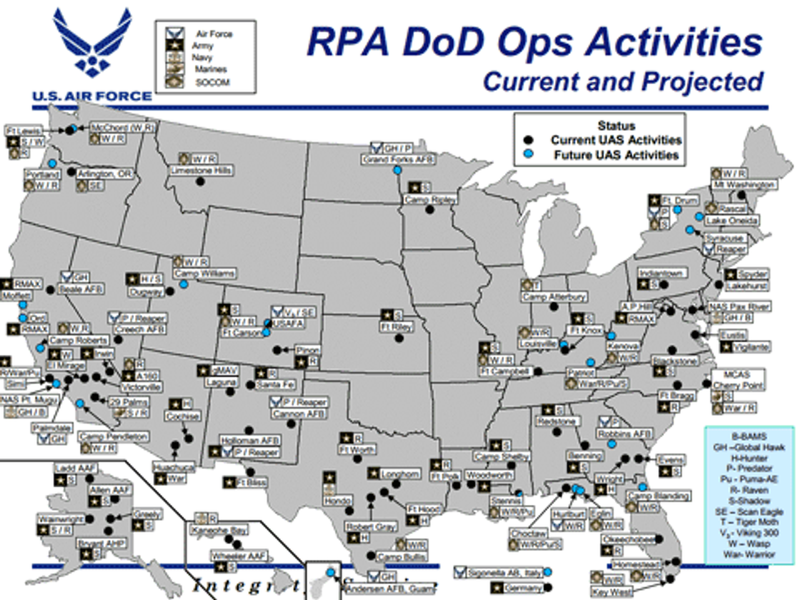 The report identifies 110 military bases that will serve as drone launch sites. The deadly Predator and Reaper drones will operate out of Creech Air Force Base (AFB) in Nevada, Holloman AFB and Cannon AFB in New Mexico, Fort Drum in New York, Grand Forks in North Dakota, Ellsworth AFB in South Dakota, Whiteman AFB in Missouri, and the Southern California Logistics Airport, among others. The accompanying map, from an Air Force power-point presentation released this month, shows current and projected locations for drone bases within the US. The ABC News report identified “political protests” as one of the activities that can be monitored by drones. According to a Los Angeles Times article in December of last year, the FBI and the Drug Enforcement Agency (DEA) are already using Predator drones for operations within the US. Last week, a huge Global Hawk drone being operated by the US Navy for an unknown purpose crashed in Maryland. The build-up of drone bases within the US is one component of preparations by the US government for a confrontation with its own population. Like everything else associated with the so-called “war on terror”—including torture, detention without trial, warrantless spying, assassinations, military tribunals, and expanded executive and intelligence powers—the use of drones for spying and assassination in the Middle East is a prelude to the development of systems that will ultimately be used against the American people in the event of social upheavals. On “Terror Tuesdays” at the White House, President Obama helps draw up a list of opponents of US policy overseas who are to be illegally assassinated by drone-fired missiles. These “kill lists” have already included US citizens. With tens of thousands of drones flying overhead, and with the US mainland designated as a “battleground” in the never-ending and geographically unlimited “war on terror,” the US ruling class hopes one day soon to be able to eliminate its domestic opponents with similar ease.